The natural rate of interest, also called the long-run equilibrium interest rate or neutral real rate, is the rate that would keep the economy operating at full employment and stable inflation. It is a function of the economy’s underlying characteristics and is not “set” by the Federal Reserve, but in some sense can be thought of as the Fed’s target interest rate when the economy is at full strength. It’s usually discussed in real terms, that is, with inflation subtracted out. It matters because it affects how the Fed steers interest rates. The Fed may temporarily set the benchmark Fed funds rate, the rate at which banks borrow from each other overnight, below or above the natural rate to stimulate or cool the economy, but will ultimately rely on its estimates of the natural rate to decide the direction rates should go and the level rates should reach. Since households and businesses make investment and savings decisions now based on what they think interest rates will be in the future, the Fed’s views on the natural rate have immediate importance. What factors determine the natural rate? An economy-wide interest rate is determined by how eager firms are to invest, and how eager consumers are to save, because an interest rate is established when a firm and a consumer can agree to exchange funds at a rate high enough for the consumer to be willing to forgo present consumption, but low enough for the firm to still make a profit on its investment. So the question becomes: What affects firms’ willingness to invest or consumers’ willingness to save? On the consumer side, one factor is impatience (the “discount rate”). How many servings of baklava would you have to promise to give someone tomorrow to get them to give up one piece today (assuming they were certain you’d deliver)? It makes sense that, as impatience increases, consumers will demand a higher return before they’re willing to save their funds. And if there is risk you might not fulfill your promise, then the more risk-averse the consumer, the higher a rate he or she will demand. Another factor is how much the consumer expects to consume in the future if he or she didn’t save anything at all. If, for example, due to an expected pay raise the consumer anticipates being able to buy lots of baklava tomorrow, this should decrease his or her desire to give up some right now to save for more later. Since how much one anticipates consuming tomorrow depends on one’s future income, and one’s future income depends on how the economy is doing, many economists think GDP growth is a determinant of the overall interest rate. This means that potential GDP growth—growth at full employment—should be a determinant of the natural rate. On the investor side, an obvious factor is what kind of return a new investment will yield (economists call this the “marginal product of capital”). If there are profitable opportunities, investors will demand funds, and this will push up the interest rate. Which of these factors is most important? More recently, some have argued that the link between the economic growth rate and the natural rate of interest doesn’t hold up empirically. If one uses moving averages of the Fed funds rate as a proxy for the natural rate (the idea being that the Fed funds rate will sometimes be above, and sometimes below, but on average close), it doesn’t seem to be strongly related to the pace of growth. Better predictors seem to be impatience and risk (both mentioned above), financial regulations (such as Regulation Q, which capped interest rates on deposits), trends in inflation, and other temporary factors such as the heavy debt of the early 90’s and the turmoil in the early 2000s caused by war in the Middle East. (For more, see James Hamilton et al.’s “The Equilibrium Real Funds Rate: Past, Present, and Future.”) In theory, the long-run equilibrium rate should not be affected by anything temporary, so whether one believes these results depends on how one feels about using average Feds funds rates—which are affected by temporary factors—as a stand-in for the natural rate. 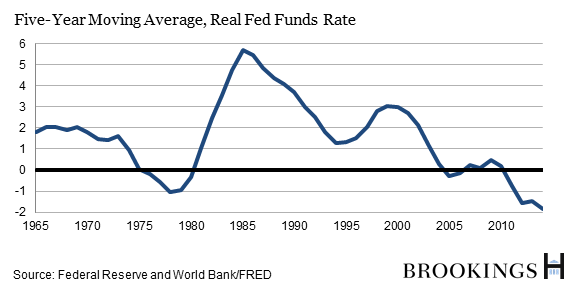 How has the natural rate been changing over time? Economists agree that it’s been declining for decades. 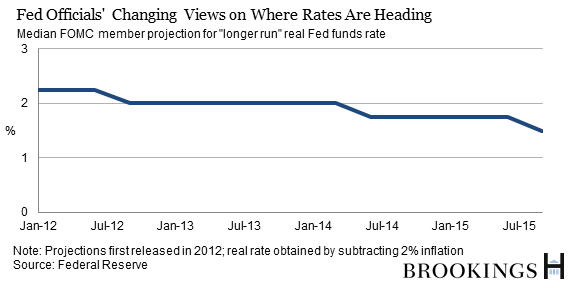 A look at the general trend of the Fed funds rate shows this clearly. Even over the past several years, estimates for the natural rate have declined. For example, the median FOMC projection of the long-run Fed Funds rate is now 0.75 percentage points lower than it was back in January 2012 when the FOMC started publishing this metric.